Library image #4093: A colorful and intricate web of peaks, gentle slopes of lava flows, and craggy cliffs. The United States Congress designated the Eldorado Wilderness (map) in 2002 and it now has a total of 32,016 acres. All of this wilderness is located in Nevada and is managed by the Bureau of Land Management and the National Park Service. This area is an intricate web of peaks, gentle slopes of lava flows and eroded basalt, and side canyons with craggy cliffs. The Eldorado Wilderness is adjacent to the Black Canyon Wilderness, separated only by a transmission line corridor. The eastern edge of the wilderness hugs the contours of the Colorado River. 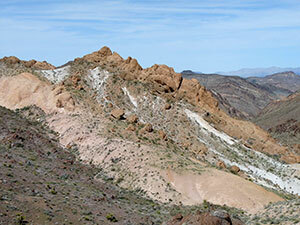 Eldorado is jointly managed by the National Park Service and the Bureau of Land Management. Paralleling the west side of the Colorado River, the Eldorado Mountains are volcanic in origin. The mountains were uplifted during the Miocene Basin and Range Uplift about 15 million years ago. They are mostly made up of Precambrian metamorphic rock topped by the beautiful reds, whites and browns of volcanic tuffs, ash, pyroclastic flows, and basalt flows that made their appearance between 40 and 20 million years ago. Ranging from 600 to 3,800 feet in elevation, the landscape in the Eldorado Wilderness area displays a thriving Mojave Desert filled with creosote bush, bursage, brittlebush, prickly pear, catclaw acacia, and a variety of cacti. Watch for desert bighorn sheep on the cliffs, while desert tortoises and jackrabbits, as well as a variety of lizards (including the collared and desert spiny lizards), wander about. Canyon wrens nest in the cliffs while peregrine falcons soar above double crested cormorants and water fowl along the river. Planning to Visit the Eldorado Wilderness? How to follow the seven standard Leave No Trace principles differs in different parts of the country (desert vs. Rocky Mountains). Click on any of the principles listed below to learn more about how they apply in the Eldorado Wilderness.